ALLOWANCES – Dearness Allowance – Dearness Allowance to the State Government Employees from 1st of July, 2017 – Sanctioned – Orders – Issued. 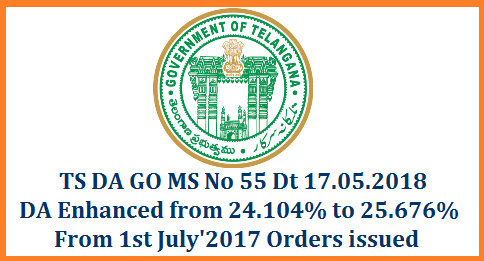 Government hereby order revision of the Dearness Allowance (DA) sanctioned in the Government Order Seventh read above to the employees of Government of Telangana from 24.104% of the basic pay to 25.676% of basic pay from 1st of July, 2017. The Dearness Allowance sanctioned in the paras 1-5 above shall be paid in cash with the salary of May, 2018 payable on 1st of June, 2018. The arrears on account of payment of Dearness Allowance for the period from 1st of July, 2017 to 30th of April, 2018 shall be credited to the General Provident Fund Account of the respective employees. In respect of Full Time Contingent Employees, who are not eligible for GPF Accounts, the arrears may be paid in cash, with the salary for the month of June, 2018, payable on 1st of July, 2018. In the event of death of any employee before the issue of these orders, the legal heir(s) shall be entitled to the arrears of Dearness Allowance in cash.